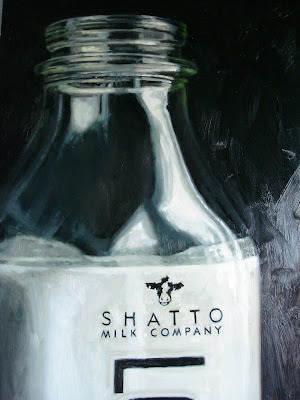 Shatto Milk Bottle - Untitled 35" x 15"
I really liked the size of this painting (35" x 15") and how it's cropped. I loved painting the glass, well, love is such a strong word. It was a challenge to paint glass but I enjoyed it (along with the Farm Fresh glass.) And painting white... ohhh... I do love painting white. I am going to do at least one other one in this Larger Than Life Locals series. Wow, that turned out great! It might be better than the real thing. You should sell a few of those at next year's Family Farm Day. I just watched your last post/painting, and that was cool! I wish I could really do 2 hours in 4 and a half minutes. You even had time to put a sweatshirt on. No really those paintings are awesome. Sometimes they look 3D. That would be fun to have prints at Family Farm Day. I showed the Shatto people the other day - Jess arranged it. I think I will mention that.